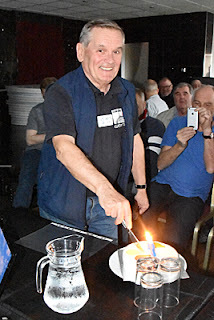 The GM-DX Convention has been held in the same King Robert Hotel in Bannockburn for twenty years. 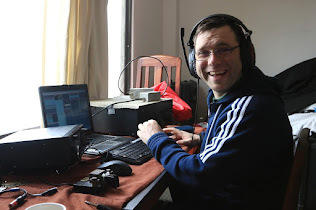 Rob GM3YTS: GM-DX 25th Birthday cake. GM-DX Speakers Lasse SM5GLC, Nigel G3TXF, Hawk SM5AQD, Chris GM3WOJ and Don G3XTT collect their GM-DX Mugs. 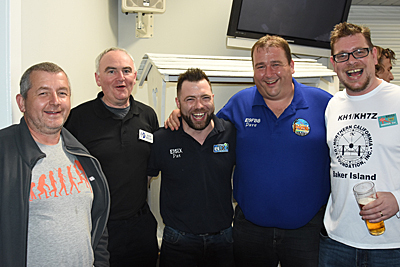 Steve MW0ZZK, Declan EI6FR, Col MM0NDX and Jonathan MM0OKG. Dave EI9FBB and Pat EI5IX. 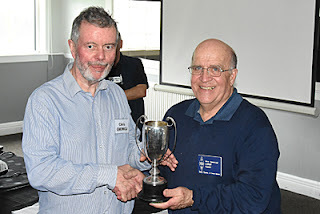 Chris GM3WOJ is presented with the RSGB's Jack Wylie Trophy by RSGB President Nick G3RWF. Tom GM4FDM and Gavin GM0GAV. Iain M0PCB, Fred G4BWP, Kerry G8VR and Neil G0JHC. Nadine MM0WNW, Ian GM3SEK, Martin GM8IEM and Aileen. Justin G4TSH, Chris G3SVL and Don G3XTT.